Father Joe’s Villages thanks staff at employee appreciation barbecue. On Friday, July 7, Father Joe’s Villages’ leadership treated staff members to a special summer surprise. 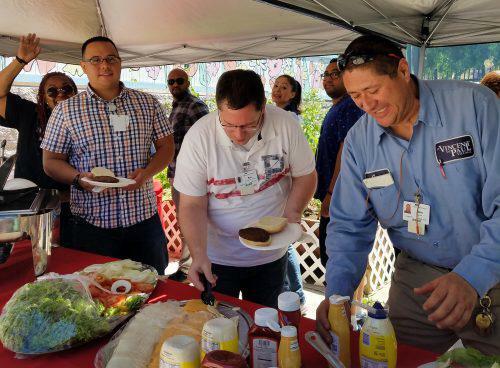 Rocio Hammershaimb, Division Director of Facilities Operations, hosted an employee appreciation barbecue to celebrate the staff’s continual dedication. 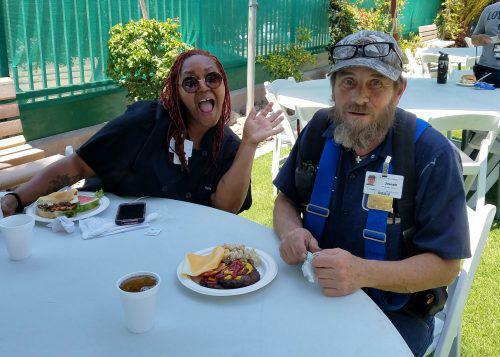 Starting at 11:30 a.m., employees gathered at the Jinny Jo Community Park to enjoy delicious food and friendly conversation. In 2016, Father Joe’s Villages staff worked to serve and support nearly 13,600 people experiencing homelessness in San Diego. Housing nearly 1,800 people a night and serving almost 3,000 meals a day, the people of our programs, facilities and administration demonstrate their commitment to our CREED daily. Consistently, Father Joe’s Villages’ employees prove their capacity for Compassion and Respect, while Empowering clients through Empathy and Dignity. Without their commitment and enthusiasm, Father Joe’s Villages could not continue on its mission to end homelessness one life at a time. [Father Joe’s Villages’] staff work tirelessly day in and day out to help many people. It is important that we take care of them and provide them with an occasion just to talk to others in a relaxed & safe environment. [The employee appreciation event is] a way to recharge. In addition to thanking Father Joe’s Villages employees, the event served as a training opportunity for our Culinary Arts Program. The program’s participants often practice serving and preparing food in the Village’s indoor dining room. The barbecue offered trainees the chance to serve and prepare food in a different environment and refine their barbecue technique. The students and their instructor, Chef Steven Keifer, prepared a tasty spread of hamburger, veggie burgers, salads, chips and drinks. Once the Culinary Arts Program served the food, staff members sat at picnic tables around the park, enjoying the barbecue and each other’s company. It was a hot, beautiful day and it was awesome to spend it outside with my coworkers… As a frequent vegetarian – I loved the veggie burgers. It’s summer and I’ll take any excuse to eat some grilled food. I am very grateful to the leadership team for the generous sign of appreciation. Father Joe’s Villages thanks all staff for working every day to make all of San Diego shine. Together, our volunteers, donors, leadership and staff help Father Joe’s Villages transform lives.